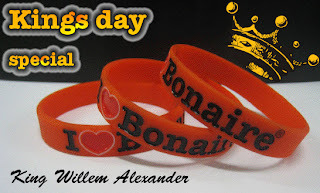 Kings Day - Koningsdag - Cambio di Trono and I Love Bonaire ®: Tuesday 30 April 2013 - Celebrate this great day with your orange wristband. Dedicated to the Queens day to Kings day celebration. This is a must have for the Crowning of King Willem Alexander. Only early birds can buy this cool orange colored silicone bracelet because we only have a limited in stock. You have to wear this collectors item during the celebrations and awaiting the arrival of King Willem Alexander to Bonaire. After visit of the royal couple you can re-use this fabulous orange wristband when supporting the Dutch soccer team playing for the World Cup. They are now available get yours now before they are out of stock.